Style. An almost esoteric word, filled with mystery. What is style? Of course, there are many definitions due to the fact that the word is used as an adjective to describe something else. Food styling for photographic purposes, for instance. Very technical. Dress style. Fashion. I am sure most of us understand that meaning of the word. Style of play in sports. Style of work ethic. Now there is a boiling pot of stories! Behaviour style. The psychological angle. How we behave under various conditions. How we react to certain stimuli. But the word can also be used to describe the way we treat each other. French hospitality, for instance. Or the traditional way us South Africans treat visitors, especially the way that one gets treated in some of the rural areas. The warm heart of Africa. The warm heart, even in France. But you need to understand the culture. One of the aspects of French style reportedly works like this: You get invited into the French host's home. You treat the lady of the house with decorum and respect. You enjoy the dinner that she prepared and you enjoy the company of your hosts. Then you go off to bed for a good night's rest. When you get to the breakfast table in the morning, you will get feedback on whether the lady of the house enjoyed your company or not. You see this in the breakfast that is served. If she likes you and would welcome you back on another visit, you may get a fluffy omelet, made by splitting the yolks and whisking the whites to a fluff, then folding in the beaten yolks. Filled with a decent helping of grated cheese, all very neatly melted. Along with other delicious bits prepared with love and dedication, including a cup of coffee made with freshly ground beans. If she did not like you, you may just get a hurried scrambled egg and a piece of burnt toast. And ersatz coffee. Perhaps even instant powdered coffee. With a shining coffee machine standing idle right behind her. Get the message? Perhaps we as food bloggers pay more attention to aspects of food and style than other people. Perhaps we are more attuned to the finer nuances of behaviour. Especially pertaining to food. Nevertheless, most people can see the difference between food prepared with love and dedication, versus a negligently slapped-up breakfast. It shows in the presentation, the aroma and the flavour. This is a plea for taking the preparation of food to heart. It reflects more about your own frame of reference than you may think. Take care in what you are doing to your visitors. Your style shows through in many more ways than you imagine. And it is worth your while to just sit down every now and then for a minute and reflect upon your next actions, instead of just barging ahead like a bull in a china shop. It may just make the world of difference to your own experience of life in general. Yes, another very high GI dish of note. Deliciously sinful. This one from a cook book that we recently unearthed from our stash of packing cases after our relocation. Some packing cases just defy unpacking. This cook book was first published in 1977, with my copy being part of the fourth print in 1988. Spys en Drank, Die oorsprong van die Afrikaanse eetkultuur, by Renata Coetzee, published by Struik Uitgewers in Cape Town. A book about the origins of the South African culinary culture. Complete with 167 authentic South African recipes. A wonderful source of information on traditional dishes. Given the blustery cold weather here in Cape Town, I turned to page 113 for the recipe on “Souskluitjies.” Buttered dumplings with cinnamon sugar. A very traditional South African dessert. The recipe is almost a no-brainer, but delicious and rich. Only seven ingredients. How difficult can it be. The original recipe does not call for any spices other than the cinnamon, but it works a lot better with a touch of vanilla. I had a double yolk egg. Nice and fresh. The traditional recipe also calls for normal flour plus baking powder. This puts the origin of the recipe post the introduction of baking powder in the Cape Colony, probably around the late 1890's. This then puts the origins of my recipe probably into the early twentieth century. I would welcome some feedback on this, my info is sketchy. I grew up having this as a special treat on a Sunday. The best version was made by my late aunt, swimming in butter and using fresh eggs that have not been in cold storage. You get a nice yellow colour. I was lucky and recently received a present of such eggs, some with double yolks. This recipe is enough for 4-6 midget sized dieters. Scale as required for normal sailing or other outdoorsy types of hungry people. Especially when it is cold outside. This dish will go well as dessert after a stewed or baked meat dish. 1 teaspoon vanilla essence. This is my variation. Mix the dry ingredients thoroughly. Rub the butter into the flour mix. Mix the milk and egg. Add Add the dry mix to the milk and egg, stirring to ensure a proper batter mix. Add the vanilla essence here if you want to. The batter should be on the thick side, more like thick syrup rather than a flapjack mix. Fill a wide saucepan to about and inch (25mm) with water. Add a pinch of salt. Bring this to the boil. Now scoop teaspoons full of the thick batter into the boiling water. Make sure than the dumplings don't touch. Turn the dumplings over to cook on both sides. Cook till done, then scoop out with a slotted spoon into a suitable dish. Fill the dish with a layer of dumplings, dot liberally with butter and a layer of cinnamon sugar, then add the next layer. The water remaining in the saucepan should be nice and thick with leftover bits of the batter. Thicken this by mashing some of the bits, add some butter and sugar. Add a little water if required. Bring this to the boil and pour over the dumplings. This week I had the most interesting experience and a very large compliment to boot. Upon my arrival home from a journey on family matters, I received an email requesting a recipe, bio and so on, as input to feature my blog and recipes on Radio Sonder Grense, the national Afrikaans medium broadcaster in South Africa. And the request came from none other than Nina Timm, intrepid cook, food blogger, mother. The list seems endless. Her blog goes by the name of My Easy Cooking. Well, after catching my breath, I found a simple recipe that suited the winter weather here in Cape Town. 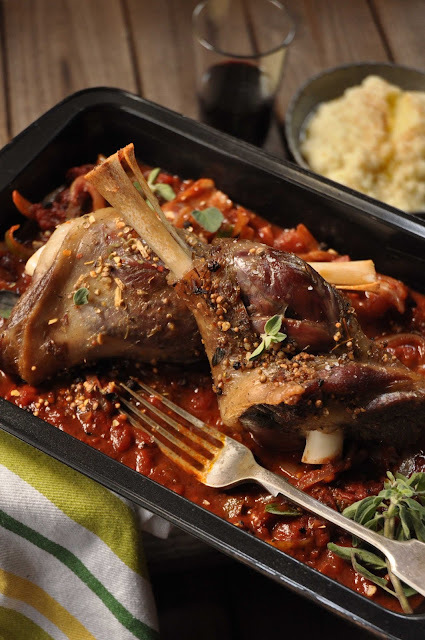 A lamb shank stew. One that we have made at home regularly, that I know works well. No use in showcasing a recipe that is prone to failure! The recipe and other info was duly submitted and the arrangements made for the interview. Now this is where the cyberstudio part comes into play. Nina asked me to be in a place where one would hear the wind and the sea, since she was interviewing the Hungry Sailor. Part of the scenery, so to speak. So I decided to go and sit on the Gordon's Bay Yacht Club roof deck. A vantage point second to none with a beautiful view. Working in a cyberstudio means that you do not really have to sit in a stuffy study at home! The interview went without a hitch and Nina prepared the lamb shanks using my recipe and in a fashion that I am humbled by the presentation! Read more about this event on her blog. This blog post authored by Johan Zietsman. This blog and a recipe will be featured on the national radio station RSG (Radio Sonder Grense) here in South Africa. Nina Timm, of My Easy Cooking- fame, has honoured me by including me in one of her broadcasts. This feature will be broadcast tomorrow, Thursday 13 June just after the 09h00 (UTC +2h) news. There will be a live interview with me via telephone, on a boat in the Gordon's Bay area. For my overseas readers, this feature will be in Afrikaans. The featured recipe will be blogged and will also be in Afrikaans. My Dutch friends should not have too much of a problem, I think! Tune in via the internet feed on the RSG home page and relive some of my adventures with me! It has been a while since my last affray into the kitchen. I have been working on boats since. I don't own a boat. I am perhaps now learning more, by working and sailing on other people's boats, than I would have by owning and sailing my own boat. A more diverse experience. And it is not costing me real money. A little for diesel here, a snack or two there, perhaps a spare or two of something. Definitely my time. A large portion of it. And the real value is in the learning. Learning about the vagaries of boats, the cost of ownership and each boat's idiosyncrasies. Yes, it is true. Every boat has her own character and whims. You learn it very fast when going sailing. Perhaps it is the same with cooking. Every cook has his or her own ideas about cooking. Very few people I know stick strictly to recipes. Which is why one gets such a rich variation in the flavours and character of the same dish prepared by different people. This morning I had a very interesting conversation with a kindred spirit in another, but overlapping dimension. You could think that you have warped into another world, very much like Douglas Adams' galactic hitchhiker. And it was a simple question that caused the warp. The question was whether I was planning to make dishes from elsewhere in the world. Which really set me thinking about what I am doing. Is it of interest to people halfway around the world living in a different culture? Am I too South African in my approach? In the end the answer was really simple, in two ways. We here in South Africa have the advantage of a culinary environment born of a fusion of Far Eastern and European cooking. Add in the influence from within Africa itself and you are left with a very rich heritage which overlaps with most of the world's cooking. Then, to top it all, we have the internet which makes the world very small indeed. Nowadays not even language is a barrier any more, since we have automatic on-line translators. Thus I have friends in the cooking field from as far afield as the USA, England, France, Spain, Brazil, India, Japan, China, Greece and Russia, to name but a few. My biggest problem in preparing a new version of a dish or just the standard version, is in the fresh ingredients. We simply cannot obtain some of the ingredients here. I would give much to be able to travel to faraway places, buy fresh produce at the market and prepare a dish or two in their local style, adapted to my whims. Perhaps, one day I shall pack up and go cruising in this fashion. For today, I shall be sticking with a bean stew. Something to make in a single pot, using meat easily obtainable in my neck of the woods. For the record, this can be looked at as a cowboy stew if you live in the USA, or a cassoulet when in France, or a bean 'poi kee' if you live down under amongst the other South African expats. The meat gets cut into cubes, the sausage into wheels and the smoked pork belly into thick slices. I am using ostrich meat and dry beans as a test. I have made this dish before using canned beans and it worked a treat, no pun intended. And this one is really good for a cold weather spell on board. Easy to make and it will keep the crew warmed and energetic for a good while. There is a caveat. As always. I used a flat shape cast iron casserole. Not the right tool for the job. Use a deep pot, as for soup. The beans need a lot of heat, even though not too high. A flat casserole simply does not concentrate the heat sufficiently. Other than that, remember to soak and/or pre-boil the dry beans for a long time, preferably overnight, lest you are left with a semi raw dish at dinner time. And if you want to do this on board, use canned beans, they are a lot less hassle on a boat. This one came out right, the beans a bit too raw when I wanted to dish up, so we had a very late dinner. But the flavour was excellent, just like the first one. Very easy to make, no stock required at all, the process makes its own stock. Ensure that you cook this dish until everything becomes mushy and amorphous, almost like thick soup. Fry the meat in turns in a dry pan. Start with the bacon, then the chourizo, then the cubed meat. At the end of this the meat should be all browned, sitting pretty on the sideline cooking in their own juices while you are doing the rest of the frying. In the pot there should be a layer of fat and some scorching. Now add the onions to the pot and fry them until they get brown. This will be quick, as they will pick up the scorched meat from the bottom. Add the chillies and garlic and fry these for 30 seconds, then add the can of tomatoes and the freshly chopped tomatoes. Turn the heat down and get these to simmer until everything is cooking nicely, then add the beans and some water. The heat can be turned down to a level where the pot is just simmering away happily, not too fast. Pay attention to the water level and ensure that the food does not stick to the bottom and burn. Keep adding water as required to keep a thickish consistency. Add the meat back towards the end, when the beans all start going mushy. Add the chopped corainder, rosemary and spring onions and stir through. Allow the dish time to repose. That is 'rest' for those of us not of Spanish persuation. Twenty minutes would be getting there. Overnight is better, but I suppose that this dish would be for dinner tonight, not tomorrow night. This blog post specifically compiled for the GBYC newsletter.